Quick and healthy Vegetable Fried Rice topped with a fried egg! This is not your typical vegetable fried rice. 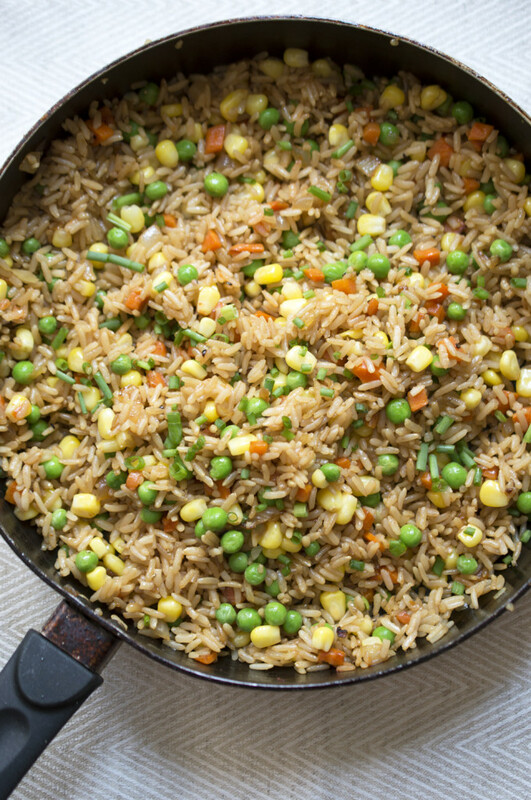 This fried rice is loaded with flavor and topped with an unexpected twist. What’s the twist? 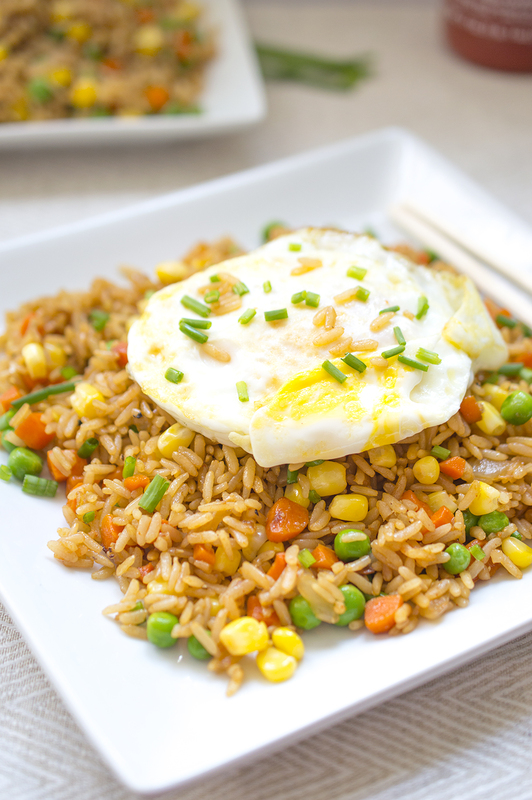 A warm hot off the pan fried egg that gets nestled on top of the fried rice. You will be surprised at the difference a fried egg can make to this dish. The trick to this recipe is to get the fried egg just right. Not too overcooked and not too runny. When the yolk is still a bit runny it creates a creamy thick sauce that you can toss over your rice. The thought of topping my fried rice with an egg never crossed my mind until I went to a restaurant in Los Angeles last October and ordered their version of fried rice off the menu. I ordered the dish not knowing what to expect and was pleasantly surprised. The rice was loaded with flavor and topped with a perfectly fried egg. 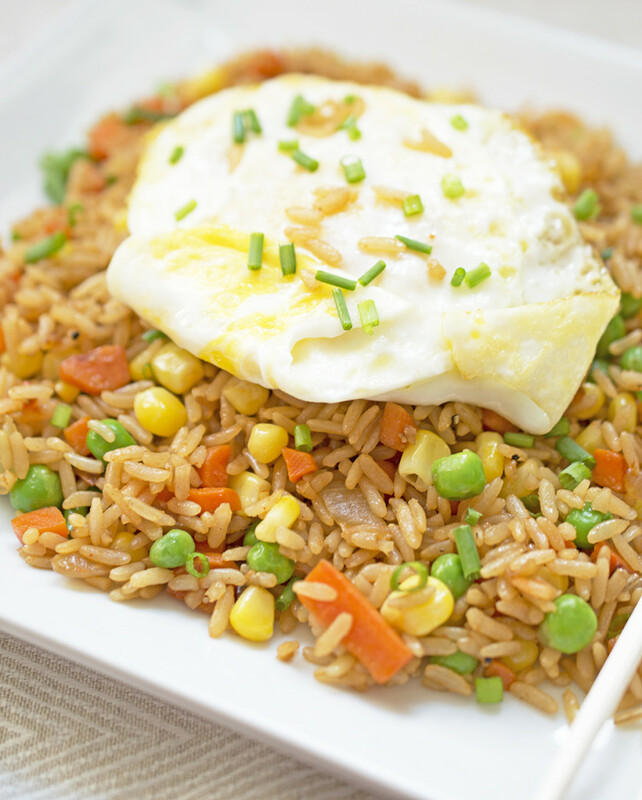 The egg transformed the rice from good to great. 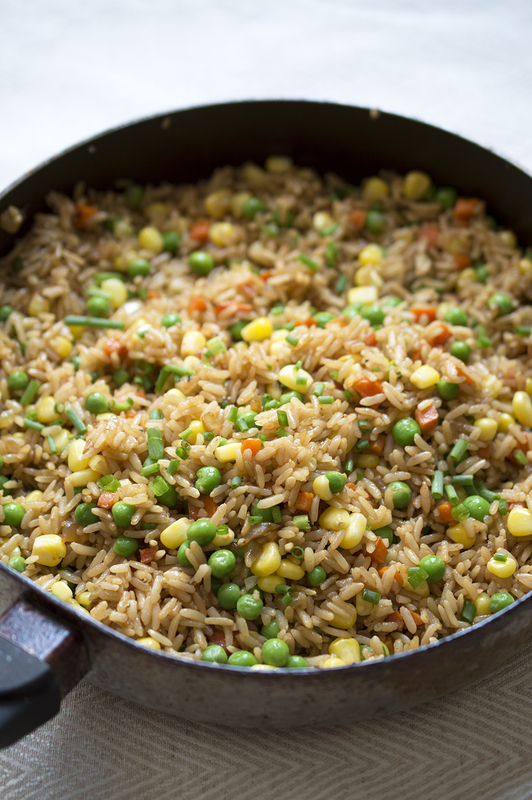 For the vegetable fried rice I added all of my favorites, corn, peas, and carrots. For a healthier substitue I used brown rice for this recipe instead of white. For flavor I added in fish sauce, soy sauce, and my favorite sriracha. If you like spicy foods like me you can serve extra sriracha on the side. I like the combination of the spicy rice and the creamy egg yolk. 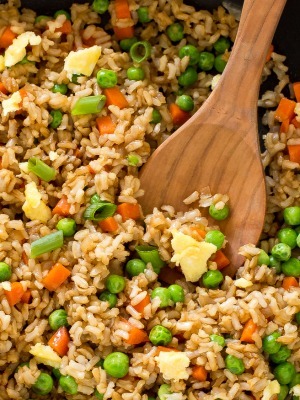 Fried rice is a good way to work in any leftovers. You can substitute any vegetables you have on hand. 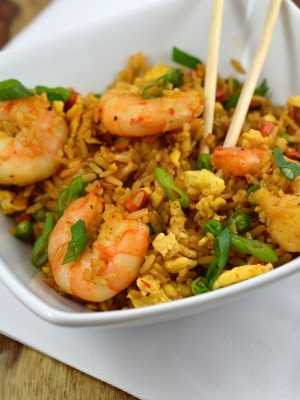 You can also toss in chicken, bacon, pancetta or try my shrimp fried rice. Begin by cooking the brown rice per the packaging instructions. (I use boil in a bag brown rice which typically takes about 8 minutes) While the rice is cooking heat a medium skillet with 1 tablespoon oil over medium high heat. Add carrots and onions and cook for about 3-4 minutes. Toss cooked rice into the pan with the carrot/onion mixture. Add the peas, corn, sriracha, fish sauce, and soy sauce. Toss to combine. Keep the heat on low to keep warm. Meanwhile, heat a small skillet with a 1/4 tablespoon olive oil. Cook 4 fried eggs one at a time with 1/4 tablespoon olive oil for each serving. Garnish with scallions and serve immediately.